Halloween is just around the corner and there are many fun ways for seniors to get into the festive spirit. Even though they may not be as energetic as children, seniors can still enjoy the holiday by spending time with their grandkids. Following are six festive activities Rhode Island at-home care providers recommend for seniors and their grandchildren. No one is too old or too young to enjoy a good old-fashioned Halloween party. Having the whole family over for Halloween games and treats is ideal for housebound seniors, especially those who require Rhode Island post-stroke care, as they may not be physically able to go out and explore on Halloween. Even if seniors cannot control a knife due to limited mobility, it is still possible to paint or draw a fun or spooky face on a pumpkin. Use water based acrylics to paint a jack-o-lantern to avoid any messes that are hard to clean up later. This is a great way for seniors to participate in Halloween that allows them to interact with trick-or-treaters from their own home. Grandchildren can participate in this activity too if they are old enough to no longer enjoy trick-or-treating. Seniors can relax and enjoy some Halloween treats with young or young-at-heart grandkids while having a fun and spooky movie night watching family-friendly Halloween classics such as The Addams Family or Halloweentown. Baking with the grandchildren is a traditional activity for seniors that is always fun. Make old Halloween favorites like popcorn balls, caramel apples, and cookies cut into bat, pumpkin, or ghost shapes. They might even consider making their own candies to hand out to trick-or-treaters like fudge or caramels. During Halloween, a lot of local churches and schools have fairs for children and their families. Seniors may not be able to participate in the games and rides, but it is still fun to walk around and watch grandchildren enjoy the event. 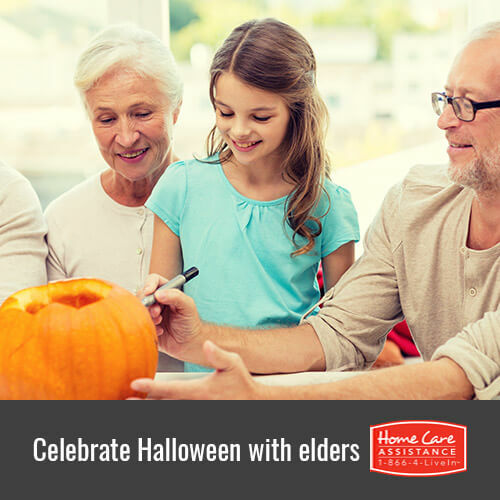 Learn more about ways seniors can enjoy Halloween with friends and family by contacting Home Care Assistance at (401) 284-0979 today. As the leading provider of stroke, dementia, and Rhode Island Alzheimer’s care, we believe seniors benefit from physical and emotional stimulation. Our compassionate caregivers work with seniors one-on-one to promote confidence, independence and overall wellbeing. Schedule a free consultation today when you call.